Technology is quickly transforming the world as we know it. These days you have to search hard to find anything that isn’t being done online from banking to taxes. In fact when you look at the toolkit of available technology there is not an industry I can think of that couldn’t have some electronic component. Case in point, the funeral industry. We are a much more portable population these days and travels plays a much bigger part in our lives however travel time is becoming a luxury. Many of us now live thousands of miles from family members and old school friends. We now spend more time on Skype, Facebook, Messenger, etc. than we do traveling back and forth. It’s a much more cost effective and stress reducing process to Skype with family members on Christmas Day than it is to fly 2500 miles to visit for four days. Technology has given us the tools to do that. We have now reached the point where the funeral industry can offer online services. Being able to attend the funeral of a loved one or long time friend can now be done without all of the required travel. We can use something as simple as a tablet and Skype call. However by using the right mix of technology it can be even more personal by allowing people to electronically “attend” the service. Anyone who knows what Second Life, as an example, is or has attended educational programs using virtual classrooms will understand the use of an avatar. Those same tools could be adopted discreetly in the funeral business. With the right software you could actually have your avatar sitting in the pew. Not only could you be sitting there but you could be using your mobile device to communicate with others in attendance be that live or online. The technology employed in virtual learning allows the user to interact in realtime and this same process could easily be incorporated in the virtual funeral process. Technology has become so miniaturized these days that a chapel could be outfitted with hidden video and audio equipment that would allow a view from anywhere in the chapel. Those attending electronically could pick and choose which camera they wanted to view through or use multiple cameras to see different views at once. The ability to quickly connect with an onsite attendee could easily be accomplished through their smart phone. FaceTime, video messaging or any other of many options could allow for real time interaction. All it would take is an interested funeral business to recognize the potential for this and begin building the simple infrastructure needed. I have reached a point in my life where I need to attend more funerals than baptisms or weddings. However the travel involved for many of these make it impossible for me to attend. Electronic attendance strikes me as a very effective option. Although many baby-boomers may see this as rather impersonal many millenials wouldn’t and definitely won’t as they age. They take the use of technology for granted. 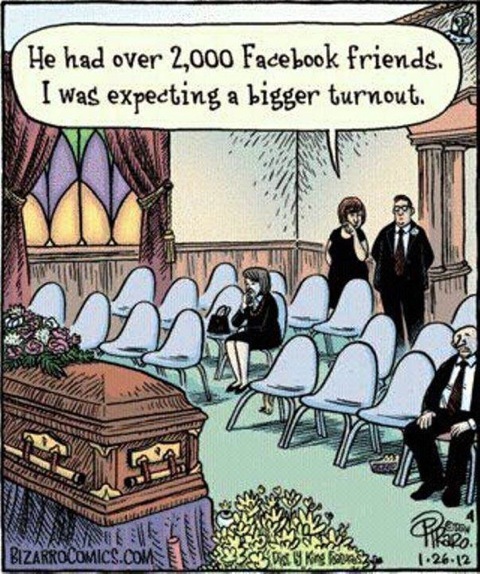 By the time they get to where funerals are more common than weddings it will probably be an expectation to attend electronically. My prediction, a growth area involving technology and death. It may not sound pleasant but it does encourage involvement. It is much more likely I would attend as an electronic attendee than jump on a plane four or five times a year to attend the event. It doesn’t even have to be a funeral business that does this. It could simply be an entrepreneur who sees an opportunity to blend technology with compassion. This entry was posted in Entrepreneurship, Social media and tagged augmented reality, avatars, entrepreneurship, funeral business, technology, technology and death, Terry Wiens. Bookmark the permalink.